Between 1823 and 1831, Second Mate Martin married and started a family and sailed the seas, battling pirates and serving on various United States revenue cutters. In 1829, he married Rachel Brown of New York City and they eventually had two children, Frank B. and Louise. The Early History of the United States Revenue Cutter Service listed Francis Martin as being stationed as a third lieutenant on the revenue cutter Rush in 1830, receiving his commission from United States President Andrew Jackson. Clarence Monroe Burton mentions Lieutenant Martin’s friendship with John James Audubon in his history of Detroit. Clarence Burton says that Lieutenant Martin and John James Audubon became friends with him while they were both in Florida. In 1831, John James Audubon arrived in Florida with the goal of collecting water birds for the third volume of his Birds of America illustrated book. He landed at St. Augustine on November 20, 1831, and traveled by pony and on foot over log roads and narrow trails. For the next six months, he explored Florida’s east coast and the Florida Keys, traveling the waterways by canoe, skiff, cutter, and schooner. In his journeys he encountered hoards of mosquitoes and Lieutenant Francis Martin. They two became lifelong friends. The statue sank with the bark Elizabeth which went down in a summer storm at Point O’ Woods of Fire Island on July 19, 1850. The Elizabeth, a 530 ton bark, had sailed from Leghorn, Italy, on May 17, 1850, carrying five passengers, a crew of 14, and cargo. The passengers included Captain Seth Hasty’s wife Catherine, Count Giovanni Ossoli, his wife Margaret Fuller, a famous writer and feminist, and their two year old son Angelino, a young Italian girl Celeste Paolini, Angeliono’s nursemaid and a Mr. Horace Sumner. Captain Seth Hasty’s wife Catherine had also made the trip with him. The cargo included rough cut marble and a large marble statue of John C. Calhoun. When the Elizabeth sank, the statue of John C. Calhoun followed the ship to the bottom of the Atlantic Ocean. The Calhoun sculpture, weighing 2,200 pounds, had sustained more damage than originally reported. A life sized figure, clothed in a Roman toga and sandals, the right arm pointed towards a scroll held in its left hand with the word “Constitution” written on the scroll. Hiram Powers represented Calhoun’s left arm as resting on a palmetto tree, but the arm as far as the elbow and the hand with the portion of the scroll it grasped had been broken off and lost. Searchers discovered the first joint of the thumb in the box, but the thumb bore the mark of a heavy blow. In the beginning years of his Revenue Marine Service, Captain Francis Martin had made wise land investments in the West which earned him a large fortune. He lived in Detroit, Michigan, in one of the most luxurious homes in the city. Every summer he “weighed anchor,” as he called it, and “stood down” toward New York City to adjust his compasses and see old friends. Like old friends, Captain Martin and Captain Shoemaker reminisced about old times. When the Civil War broke out, Captain Shoemaker was a third lieutenant in the Revenue Marine serving aboard the United States Revenue Cutter Robert L. McLelland. Captain John G. Breshwood, commander, sympathized with the South and he refused to sail the McClelland north. United States Secretary of the Treasury John Adams Dix sent an order to Second Lieutenant Samuel B. Caldwell to arrest Captain Breshwood, and assume command of the McLelland, The Secretary of the Treasury said that if Captain Breshwood attempted to interfere with the order, Lieutenant Caldwell should consider him a mutineer and treat him accordingly. The message concluded with these words: “If anyone attempts to haul down the American flag shoot him on the spot.” Confederates intercepted the message and the McLelland joined the Confederacy. Confederates also confiscated the USRC Cutter Lewis Cass stationed in New Orleans. Captain Shoemaker was one of the officers who received the Secretary of Treasury’s order and one of the ten Revenue Marine officers serving in the Gulf of Mexico remaining loyal to the Union. When Captain Shoemaker reached the North, he joined the Revenue Steamer Bibb, which along with the Revenue Steamer Corwin was stationed in New York Harbor as port guard ships, each of them carrying 8 officers and 125 men. Captain Douglass Ottinger, current age 89, commanded the Corwin, and Captain Francis Martin, current age 94, commanded the Bibb. Sitting snugly in the cabin of the Hudson, the two captains discussed many old Civil War scenes. Captain Martin asked Captain Shoemaker if he remembered the time they stopped Captain Ambrose Burnside’s fleet in New York Harbor. Captain Martin ordered Lieutenant Shoemaker and other Bibb crew members to order the steamer to stop and when it didn’t, he ordered them to fire. They sent a nine inch shell toward the steamer but it still didn’t stop. Another nine inch shell through her walking beam finally brought the steamer to a halt. Captain Martin rubbed his hands and nodded his head, his face glowing at the memory. “Aye, and it was well done, Shoemaker. It was well done,” he said. The steamer crawling along the Long Island shore turned out to be one of Colonel Ambrose Burnside’s transports attempting to push out to sea after sunset. When the soldiers at Fort Lafayette heard the shots from the Bibb, they opened fire. According to Captain Shoemaker, the blundering work of a volunteer officer commanding the transport nearly caused the death of many of the soldiers on board. Captain Martin returned to Detroit after his visit with his old shipmate. In the late 1860s, Captain Martin commanded the Revenue Cutter General Sherman, stationed at Cleveland, Ohio, to collect revenue and customs duties. The 1870 Federal Census shows that Captain Martin lived in Painesville, Ohio, within commuting distance of Cleveland and the Johnson, with his wife Jane, his two daughters Louise and Jessie and his son William. By 1872, Captain Martin in his family had settled permanently in Detroit, living at 159 First Street and by 1873, he commanded the William P. Fessenden. The William P. Fessenden had been launched in mid 1865, but the official record showed her not entering actual service until April 19, 1869 when she followed her orders to begin patrolling from her home port of Cleveland. During the active shipping season the Fessenden patrolled the Great Lakes and usually from December to April she laid up for the winter. In 1875, the Revenue Service ordered her to be laid up in Detroit instead of Cleveland. 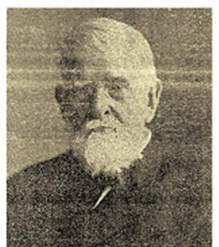 The San Francisco Call of June 26, 1894, noted that Captain Francis Martin, who retired from the United States Revenue Marine in 1877 after forty-six years of service, celebrated at Detroit recently his ninety-fourth birthday. “He uses glasses when he writes, but reads without them,” the story said. The Boston Evening Transcript mentioned Captain Martin’s 94th birthday celebration in a story dated June 9, 1894. In 1900, 99 year old Captain Martin lived in Detroit with his wife, 64 year old Jane and his daughters Louise and Jessie. Newspapers reporting Captain Martin’s 100th birthday party included the Detroit Free Press and the Advent Review and Sabbath Herald published in Battle Creek, Michigan. The story said that Captain Francis Martin had recently celebrated his 100th birthday in Detroit, receiving many guests, who cordially congratulated him on his heath. Donald Canney. U.S. Coast Guard and Revenue Cutters, 1790-1935. Annapolis, MD: Naval Institute Press, 1995. Douglas Peterson. United States Lighthouse Service Tenders, 1840-1939. Annapolis: Eastwind Publishing, 2000. U.S. Coast Guard. Record of Movements: Vessels of the United States Coast Guard: 1790 – December 31, 1933. Washington, DC: U.S. Government Printing Office, 1934; 1989 (reprint).